Discover a multi layered, complex mouth feel, a fresh and crisp vibrancy with lingering flavours of Cape gooseberry and zesty fruit with a subtle mineral finish. The classic maritime Sauvignon Blanc, made from grapes sourced from four premium wine regions, reveals aromas of cut grass, asparagus and hints of citrusy tropical fruit. Discover a multi layered, complex mouth feel, a fresh and crisp vibrancy with lingering flavours of Cape gooseberry and zesty fruit with a subtle mineral finish. The grapes were handpicked in the early hours from the broader Western Cape region. Covering a vast area of over 400 kms, vineyards were selected from several premium wine regions in an effort to showcase the unique diversity in flavour profiles available within the are Western Cape. The grapes did not receive any skin contact and were gently pressed. Fermentation lasted 3 weeks at 15 ̊C. The wine was left on its primary lees for 5 weeks post fermentation and, after blending, an extra 3 months on fine lees. Delaire Graff Estate is situated in Stellenbosch in the heart of South Africa’s most historic and prestigious wine region. Founded by Simon van der Stel in 1679, Simon brought a sound knowledge of viticulture, the art of wine making – fostering a tradition that has grown from strength to strength through the centuries. In 1982 John Platter, well known wine writer, bought Delaire, then known as Avontuur. Looking at the magnificent view, he decided to rename the farm Delaire Estate, meaning "From the Sky”. Laurence Graff, Chairman of Graff Diamonds International acquired the estate in 2003 and vowed to transform it into South Africa’s most desirable art, hospitality and wine destination. Today, with two outstanding restaurants, a state-of-the-art winery, exclusive Lodges, a destination Spa and two luxury boutiques, the transformation of this piece of paradise is complete. Delaire Graff Estate’s unique terroir on the crest of the panoramic Helshoogte Mountain Pass is noted for its high-altitude vineyards, excellent soils and cooling sea breezes. 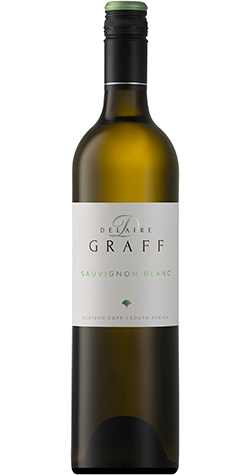 Delaire Graff Estate aims for red wines that are big in structure with soft tannins and elegance, and white wines which capture the freshness of the harvest. With one of the most advanced cellars in the Southern Hemisphere, which became operational in 2008, in just three years the Estate can be comfortably rated as one of the top ten wine producers in South Africa. From the outset wine quality has been superb and Delaire has achieved a stellar rise.